My name is Marlene Day-Bateman a.k.a. Marly Day. Throughout the past 25 years, I have been in training and participated in traditional ceremonies by elders far and in our local communities. I was recently Initiated through a traditional ceremony to carry the rights and accepting the title “Traditional Ojibway Grandmother”. (Nookimis) With this title I’m responsible to carry out the roles and responsibilities of a Grandmother. Throughout the years I’ve also earned the right to carry a Traditional Sacred Bundle as a helper to Women or in Group work. 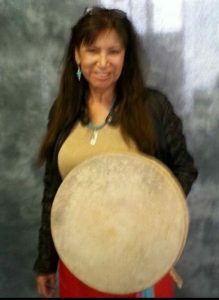 For 17 Years I was the lead in a Women’s Hand Drum Group ( Wabshke Niimki Kweok). I conducted various traditional ceremonies as a healing method to help individuals. However, I continue to learn. I work with the female youth/women to help them seek their true identity in the Cultural aspect through Leadership roles in Beauty From Ashes. This program was designed to help adults overcome their childhood trauma. I was also the lead role in the Thinking Rock Community Arts Production of “The Rivers Speak” as Thunder Bird Women, working with all Nations to help break the division between Cultures. have 25 Year Training with Traditional Elders. am Conductor of Traditional Ceremonies to support women. have 4 Years experience working in Anti Human Trafficking for Kii_Gaa-Do-Waak Nookimisuk (Grandmother Council). Conducting Traditional Ceremonies is a important part of prevention. It helps to connect an individual to their heritage and an understanding of who they are as a people. am part of the Indigenous Women’s Coalition to help raise awareness for issues that need to be addressed in various places.